2 In small bowl, mix 1/2 teaspoon of the salt, the garlic powder, 1/4 teaspoon of the pepper and the ground red pepper. Season chicken with salt mixture. 3 In 12-inch ovenproof skillet, heat oil over medium heat. Add chicken, skin-side down, and cook 7 to 8 minutes or until golden brown and crispy. Remove skillet from heat, and remove chicken from skillet; drain fat. Add potatoes, carrots, remaining 1/2 teaspoon salt and 1/4 teaspoon pepper to skillet; stir to coat. 4 In small bowl, mix honey and Sriracha. Set aside 2 tablespoons mixture. Add garlic to remaining honey mixture. 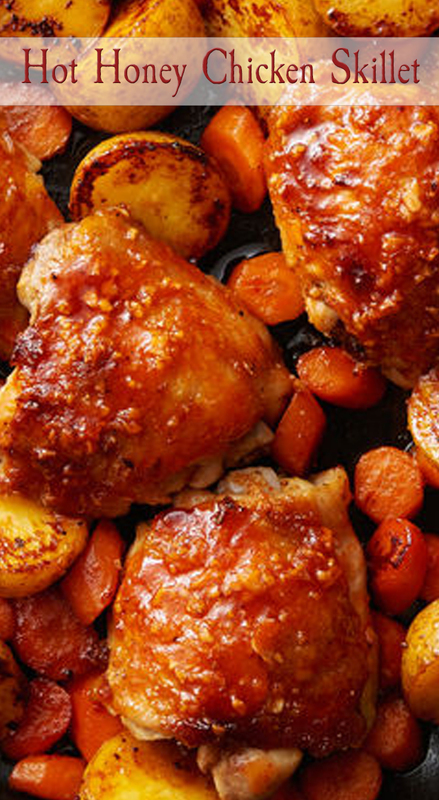 Place chicken on top of vegetables, and brush tops with honey-garlic mixture. 5 Place skillet in oven; roast 20 to 25 minutes or until juice of chicken is clear when thickest part is cut to bone (at least 165°F). Remove chicken; cover and keep warm. Stir vegetables. Place skillet back in oven 10 to 15 minutes or until vegetables are tender and potatoes are lightly browned. Brush reserved 2 tablespoons honey-Sriracha mixture on chicken, and serve.